What is cold press oil? The authentic way of grinding the oil using wood is known as cold pressed oil. Oil can be obtained by pressing / crushing of Coconut (copra), groundnuts, sesame, safflower seeds. This is the ancient method to take oils from the seeds. By this way, one can maintain health and well-being to a large extent. To ensure resulting 100% pure oil and retains all the properties of seed oil. The cold pressing process does not need an external substance as with other methods. The seeds are crushed and pressed to force the oil out in lower temperature to retain all its nutrients. Why to switch to cold pressed oil? It is not refined, deodorized or processed in any way. It does not contain harmful solvent & residues. The natural flavor and odour is retained, enhancing your favourite recipes and taste buds. 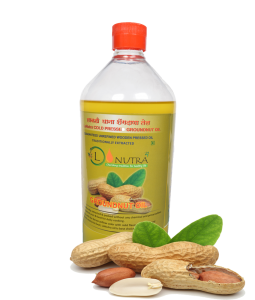 Cold pressed groundnut oil acts as a soother to you heart pericardium musclesand protects the heart. Antioxidants presents in these prevent the growth of tumour cellsin body to a greater extent. Cold pressed oils retain all their flavor, aroma, and nutritional value, making these oils great for cooking and skin care requirements. They are naturally cholesterol-free. Start using unrefined cold pressed oil instead of refined oil in daily cooking for healthy life.